Bones and metal parts are fused together to create the skeletons of bizarre bionic animals straight out of science fiction. Beetles’ wings are spread to reveal complex arrangements of gears. Robotic creatures walk, run and slither just like their living counterparts. 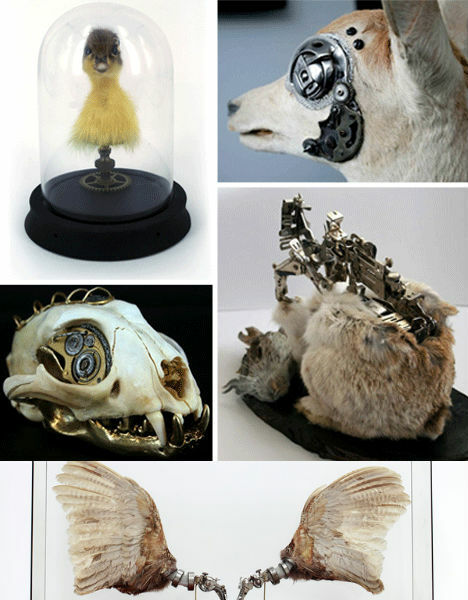 These 36 mechanical animals by 11 artists are sometimes nightmarish but undeniably fascinating to view. 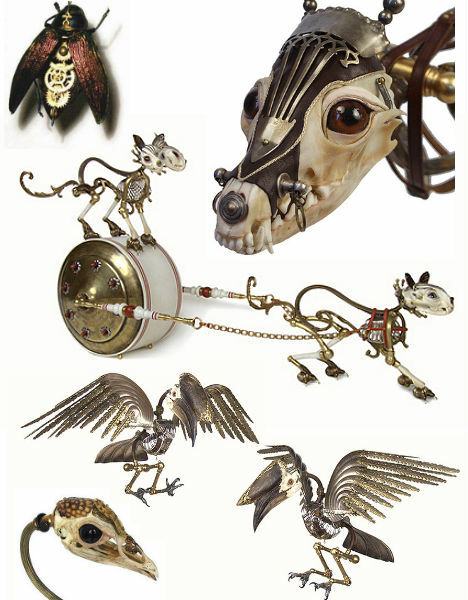 Combining animal bones and discarded scrap metal into stunningly intricate sculptures, Jessica Joslin has created a zoo of surreal steampunk creatures. Though Joslin once sourced the skeletons herself, largely from roadkill, she now purchases the bones from certified dealers. Gas lamps, radiators, chandelier parts and light fittings are among the detritus that are transformed into headdresses, ornate costumes and other details for the sculptures. 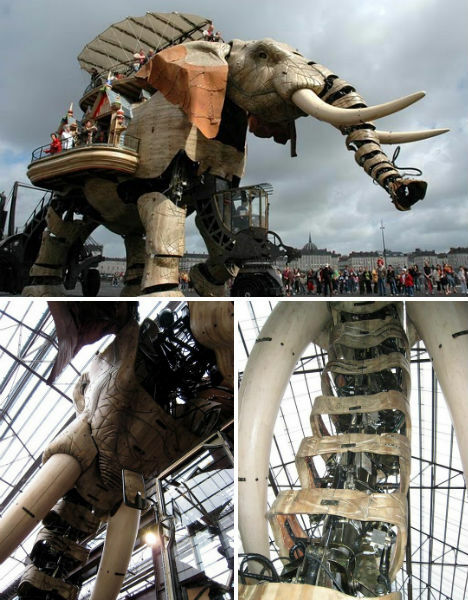 At 2010′s Exeter Summer Festival in England, a massive mechanical animal sculpture actually walked around on the beach – with the use of wind power. 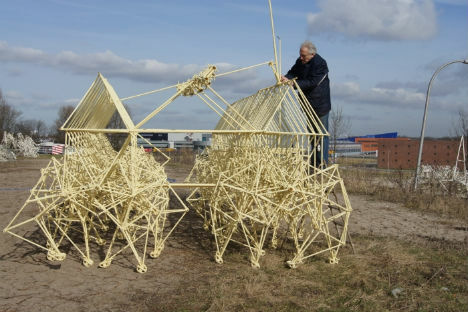 Theo Jansen, a Dutch artist and kinetic sculptor known for his large works resembling skeletons, created ‘strandbeest’ out of scrap plastic tubing and water bottles. Jansen has displayed similar sculptures at many other festivals and events over the years. 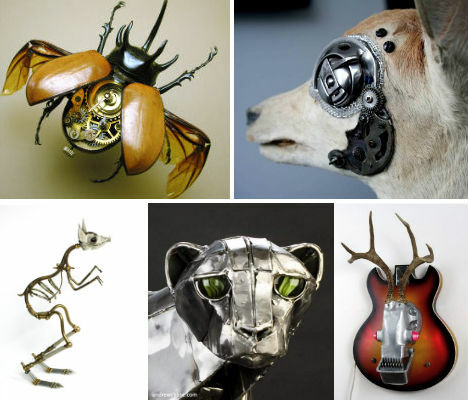 Fully automated and strikingly complex, Andrew Chase’s metal sculptures recreate animal biology with reclaimed metal like automobile and plumbing parts. The elephant can lower its trunk up and down, the giraffe’s neck rises and, with the magic of stop-motion animation and Chase’s brilliant mechanics, the cheetah can actually run. An acoustic guitar and a rocking chair became “Acoustapus”, while an electric guitar and an electric jackhammer make up a frightening creature known as “Heavy Metal”. 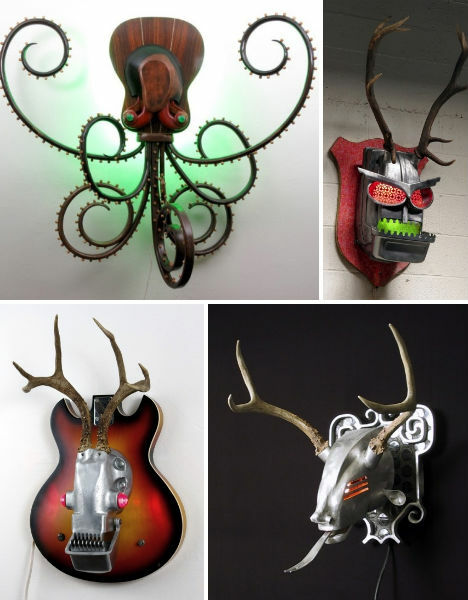 Other metallic steampunk ‘trophy heads’ by Nemo Gould incorporate garden trowels, parts of a golf caddy cart, salad spoons and vacuum cleaners. 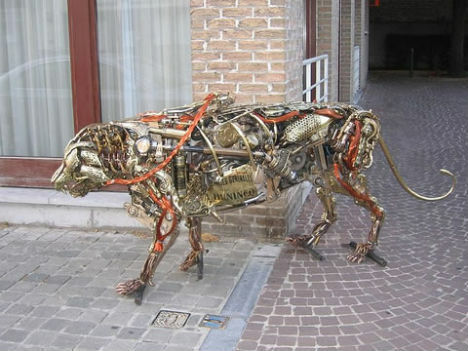 In 2008, the French city of Nantes became home to an imposing collection of machine-inspired animal sculptures by François Delarozière and Pierre Orefice. 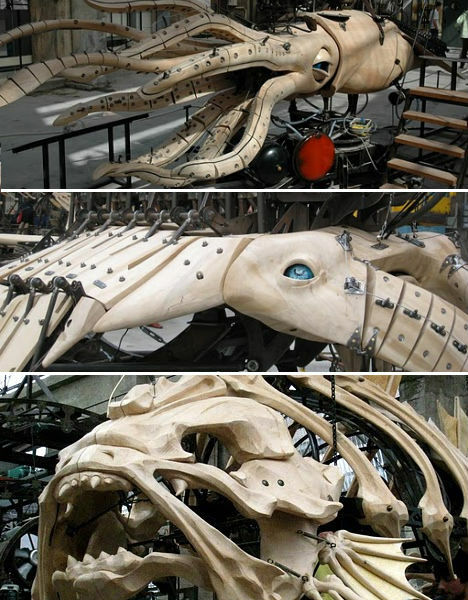 Manta Rays, squid and sea monsters with chilling blue eyes are fitted with all manner of mechanical parts, and each of these creatures is actually a moving vehicle. Most impressive of all is Le Grand Elephant, a 36-foot-tall sculpture weighing more than 40 tons. 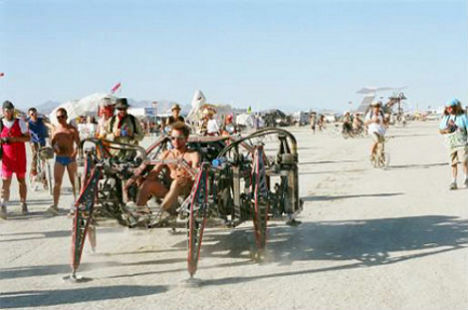 This amazing mechanical spider was built in 2005 and 2008 and has toured such events as Burning Man. The 8-legged arachnid was originally powered by a Honda V-twin engine and a system of hydraulic pumps and motors, but got a zero-emission makeover in 2010. 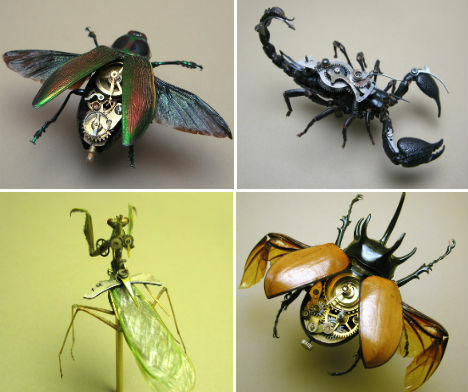 Mike Libby dissects beautiful insect and arachnid specimens and replaces their innards with watch parts. Scorpions, beetles, spiders and butterflies are among the creepy-crawly creatures that have gotten the steampunk treatment for his series, Insect Lab. 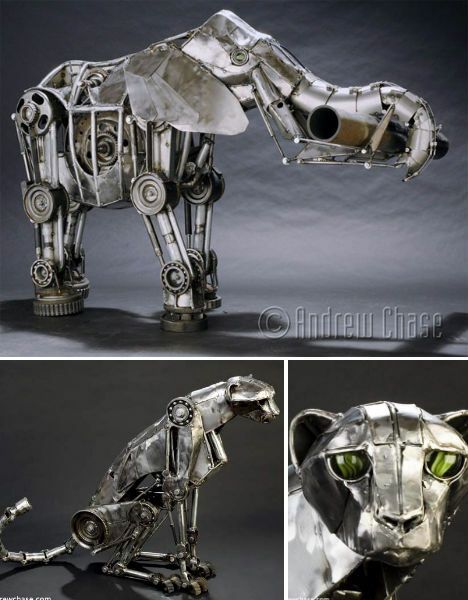 Not only is this mechanical tiger a jaw-dropping metal representation of a tiger’s anatomy – it’s also rideable. The robotic giant cat actually walks (albeit very loudly, with the use of motors). 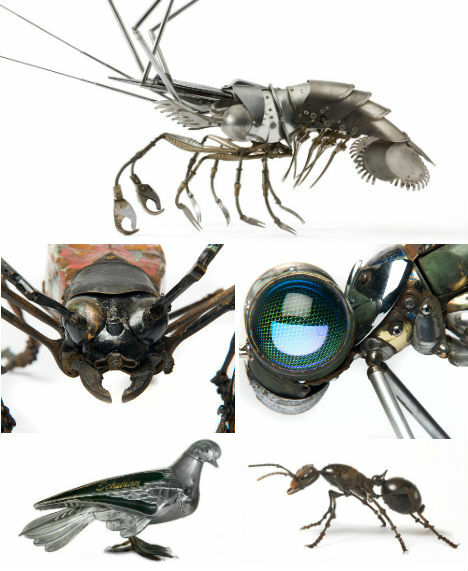 Radio antennae, hair pins, electrical fans and bike brakes: all of these parts went into the shrimp in the top photo, made by artist Eduoard Martinet. The sculptor gathers up unwanted materials and pieces them into carefully crafted, imaginative little critters that strikingly resemble the real thing. Cool snake robots like this one, built by Dr. Gavin Miller, are not just being developed for fun – they could eventually be used to disable explosives. 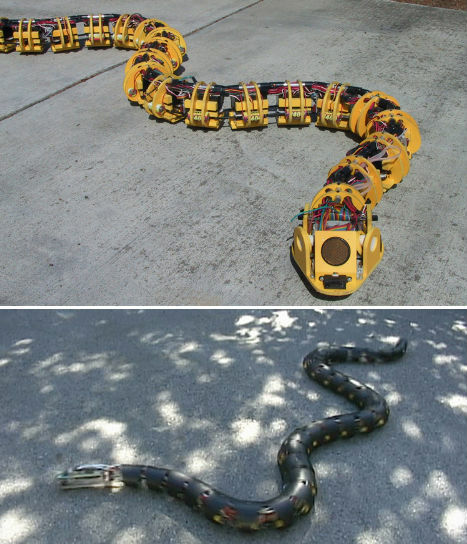 Miller’s series of robotic snakes move in a way that’s stunningly similar to real snakes; his latest prototype is equipped with motion and range sensors. Wow they looks so realistic i can't believe on my eyes does this uses aluminum tube suppliers? One of the most precious moments for me is when I see my son playing with fiberglass sculpture of animals, which are his favorites.